Basecamp Classic: Can I move multiple milestones at once? Can I move multiple milestones at once? Yes, click on a milestone and select a new date you want to move it to. 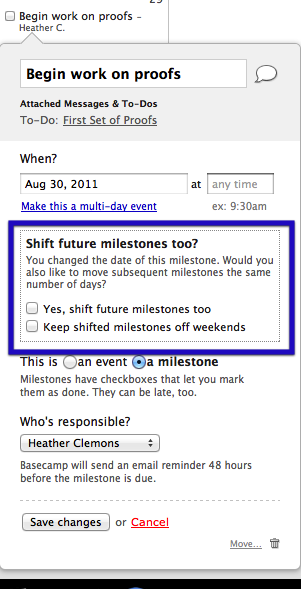 Then check “Yes, shift future milestones too.” For example, check the box and move a due date out 5 days and Basecamp will also move all future milestones out 5 days as well. This shift will only apply to this project. Items entered as Events won’t be shifted. Selecting “Keep shifted milestones off weekends” will move milestones that land on a weekend forward to Monday. At this time, spanned milestones can’t be shifted.